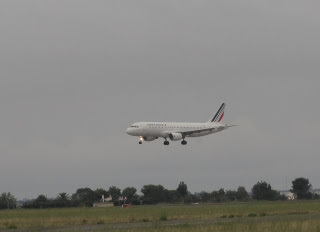 A far cry from the grandiosity of Barcelona airport (BCN), or even the super-fast growth of neighboring Girona-Costa Brava (GRO) airport, the small airport at Perpignan, in the South of France right next to the Spanish border, has preserved some of the obvious advantages of small regional airports. If commercial offering is almost non-existent in the terminals, the no-crowds, no hassle, fast boarding experience is a strong positive point. With only a handful of flights per day (namely Air France to ORY, Ryanair to Stansted and Charleroi and the new several-times-a week Flybe routes to Birmingham and Southampton and BmiBaby to Manchester), airport transit procedures are quick and efficient. Perpignan (Perpinya in the local Catalan language) is the entry point to the wine-growing Roussillon area, which has many important, if a bit underrated, tourist attractions, such as the Cote Vermeille (with the magnificent seaside town of Collioure/Cotlliure) and the Pyrenees. 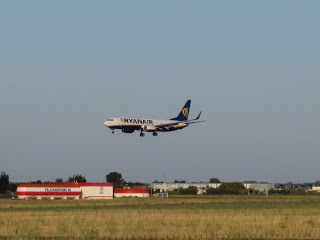 With Girona airport becoming ever more congested (although this might change again as a result of Ryanair's recent landing at BCN), Perpignan can be given serious consideration (provided you have a car) as an alternative entry point to the Costa Brava. Planespotting at Perpignan is quite limited given the small number of regular flights at the airport, nevertheless, in my recent visits to the airfield I could see how some roadside areas on the approaches to the airport are always packed with spotters at the times when there is some air traffic at the airport. So I joined the crowd and here are the pics!